GnatMQ and SSL/TLS support : make it up and running ! After the last blog post on the new GnatMQ release with SSL/TLS support, it’s now time to show how to use this new feature. Speaking about SSL/TLS security means to speak a lot about asymmetric encryption (even if symmetric encryption is used as well) and X.509 certificates. Regarding asymmetric encryption we know that it’s based on public and private keys compared to symmetric encryption that uses only one shared key. Simplifying how asymmetric encryption works we can say that the message sender needs the public key of the receiver in order to use it for encrypting data. The receiver is the only one to have its private key so that it’s the only one that is able to decrypt a message that was encrypted with its own related public key. It means that public key can be distributed publically but private key must be kept secret. Asymmetric encryption can be used not only to encrypt data but for signing it too. In this case, the sender processes an hash on the message to send using its private key; the receiver can use the corresponding sender public key to verify the signature (the hash) and in this way it can be sure that the message was received from the right sender. Of course, it’s only a simple and brief introduction on how asymmetric encryption works and I can suggest you to deep into it finding a lot of content online. How is asymmetric encryption related to SSL/TLS protocol ? I said that the server private key is used only during SSL/TLS handshake and not for encrypting all messages exchanged during connection. It’s true because during this phase, client and server exchange some information to generate a symmetric key that they will use during communication to encrypt all exchanged data. Why this step from asymmetric to symmetric encryption ? Asymmetric encryption is more complex than symmetric and it needs more CPU and memory footprint for executing even if it’s more secure than symmetric. This one is less complex and doesn’t need huge resources for processing. This is the reason why for generating a symmetric key, the client and server use asymmetric encryption with more load during the handshake but they use the generated symmetric key for encrypting all traffic to be much faster during communication. Now, the big question is : how the client can be sure it’s talking with the server it’d like to talk ? Here the X.509 certificates standard and the Certification Authority concepts come in and of course the second possible usage of asymmetric encryption : the signature. The server public key must be signed by a trusted third party authority so that the client can trust this public key and check that it’s talking with the right server. A Certification Authority (CA) is a trusted third party that distributes X.509 certificates : you can think about a certificate as a server public key with a signature from CA (with more other information). It means that we can buy a server certificate from a CA directly or we can ask the CA to sign our already generated public key. Of course the CA uses its own private key to process the hash/signature for that public key to obtain a valid X.509 certificate. How the client is able to check the server certificate validity ? Of course, the client needs the CA certificate (its public key) and can use it to verify the signature on the received certificate from the server. Now you could ask … who signs the CA certificate ? In this case the CA is considered as a “root” so no other trusted third party over it; for this reason the CA certificate is self signed and it means that it’s signed by the CA itself … you need to trust it ! However you need to know that there are CA certificates not self signed but signed by other CAs; in this way there is the possibility to have CAs who can distribute X.509 certificates to companies but you can’t consider them as “root” because their certificates are signed by other “root” CAs. After this higher level introduction to SSL/TLS (you need to deep into it for understanding it better), it’s time to “play” with certificates and prepare our GnatMQ broker with the new security feature. First of all we need a CA certificate to generate and sign the server certificate. We could buy the server certificate from a trusted third party Certificate Authority such as GoDaddy, Symantec (Verisign), Comodo or GlobalSign but only for testing, we can first generate a self-signed CA certificate and then using it to sign our server certificate. With our CA certificate we are able to impersonate a trusted Certification Authority so that we can sign any other certificate we’d like to use for our servers. Remember that the certificates story starts from generating a public and private key for asymmetric cryptography. A server public key is signed with a CA private key to obtain a so called “certificate”. In this way the server public key can be distributed publically in a certificate fashion. In the case of a self-signed CA certificate, the CA private key is used to sign the same CA public key to obtain the self-signed CA certificate itself. To execute all available operations on X.509 certificates (create, sign, convert and so on) there are two main available tools : OpenSSL or Makecert. During this article we’ll use Makecert that we receive with our Visual Studio 2015 installation (it’s available with previous versions as well). Of course, the certificate generation operation will generate both private key and public key; the last one will be signed to become a standard X.509 certificate to distribute publically. with a lot of “options” we can specify and the output certificate file. It’s important to notify the the -n parameter can receive more other options like Country Name (C), Organization Name (O), Locality Name (L) and so on; in this case a more complex value could be : “CN=MyCARoot,C=Italy,O=MyCACompany,L=Naples”. There are a lot of other options you can specify like the expiration date and so on. For more information, you can see the official documentation for Makecert tool. After executing this command you are prompted to insert the “passphrase” (a password) to protect the private key. The first time you need to create the password for the private key and the second time you are prompted to insert the previous one to access the private key and (self)signing the certificate. Now we have the MyCARoot.cer file and the MyCARoot.pvk file. The former is the self-signed CA certificate in the DER (binary) format and the latter is the private key used to signed the generated public key to obtain the above certificate and that will be used to sign any other server certificate. Next step is to create the server certificate and sign it with the above CA certificate (using the related private key of course). As for the CA certificate generation you are prompted to insert the passphrase to protect the private server key. In this case, you are prompted to insert the passphrase for the CA private key too (the Issuer) because it is necessary to access the CA private key for signing the server public key and generate the certificate. In order to use the server certificate inside the broker we need to export it in the PFX format (predecessor of current PKCS#12). The PKCS#12 evolved from the personal information exchange (PFX) standard and is used to exchange public and private objects in a single file. It means that the single PFX file contains both the public and private key of the server. In this way, it has all needed data to support an SSL/TLS connection for deploying its certificate and encrypt data using the private key. This is the reason way we used the “pe” option in the Makecert command to mark the private key as exportable into the PFX file. Now we are able to use the server certificate to create a GnatMQ instance with SSL/TLS support. You can get the latest version as Nuget package and reference it inside your project. You can use the MqttBroker class instance inside a simple console application or a worker role on Azure; it’s up to you how to use it. For a simple example, the console application is the right choice. First of all you need to add the generated GnatMQ.pfx file as resource inside your project to make it available in your source code. In this way the broker is up and running and can accept only SSL/TLS connections ! Another way to instantiate the class is to use the constructor with other parameters like the RemoteCertificateValidationCallback and LocalCertificateSelectionCallback that you can use to customize the certificate validation and selection process. Remember that any client you use to connect the broker it needs the self-signed CA certificate and your connection will be protected and encrypted after the server authentication. Last one thing to know is that the SSL/TLS feature is supported by GnatMQ only for the .Net Framework platform and not for the WinRT (Windows 8.1 and Windows 10) due to the sandboxed execution environment that doesn’t accept incoming SSL/TLS connection (only as client). Dopo aver rilasciato la nuova versione della mia libreria M2Mqtt con il supporto per l’SSL/TLS con autenticazione lato server, è giunto il momento di mostrarvi un esempio di utilizzo. In primo luogo dobbiamo scegliere un broker MQTT tra quelli disponibili ma purtroppo nessuno è sviluppato utilizzando il .Net Framework. Scartando soluzioni più complesse, soprattutto per quanto riguarda l’installazione e la configurazione, come IBM Websphere, possiamo prendere in considerazione dei broker come RabbitMQ, HiveMQ oppure Mosquitto. In questo caso, la mia scelta è caduta proprio su Mosquitto che possiamo scaricare dal sito ufficiale per vari sistemi operativi basati su Linux, così come è presente un comodissimo installer per l’ambiente Windows. In realtà, per Windows esistono due modalità di installazione : la prima utilizza un installer in cui il broker è compilato in maniera nativa mentre nel secondo caso ci si basa su Cygwin che fornisce un ambiente Linux-like per Windows. E’ ovvio che la prima modalità è la più semplice ed immediata. Al termine dell’installazione, oltre ad essere installato il broker vero e proprio (mosquitto.exe), saranno forniti anche due applicazioni console che rappresentano un publisher (mosquitto_pub.exe) ed un subscriber (mosquitto_sub), molto utili per testare il funzionamento del broker stesso. L’utilizzo di Mosquitto è molto ben documentato sul sito ufficiale ma ciò che noi interessa sapere è soprattutto la parte di configurazione legata all’SSL/TLS. Per modificare le impostazioni di default del broker, quest’ultimo può essere lanciato specificando un file di configurazione (un file di esempio mosquitto.conf è presente nella cartella di installazione). Prima di affrontare tale argomento, è necessario generare i certificati della CA (Certification Authority) e del server/broker che andremo ad utilizzare nel corso dell’esempio. Lo so, avete ragione, non è normale che un’installazione non termini nel migliore dei modi…e sono perfettamente d’accordo !! Ma superato questo scoglio, OpenSSL è sicuramente il migliore ! Tutte le operazioni che seguono, vanno eseguite dal prompt dei comandi all’interno della cartella C:\OpenSSL-Win64\bin\PEM, nella quale OpenSSL gestisce il suo store di certificati. attraverso il quale otterremo una chiave privata per la CA (m2mqtt_ca.key ed il certificato “self-signed” m2mqtt_ca.crt). Verrà richiesta una “pass phrase” per crittografare anche la chiave privata ed in successione tutte le informazioni relative al certificato (Country Name, State, …) tra le quale ho preferito impostare come CN (Common Name) il nome del mio PC (questa impostazione è più strettamente necessaria al momento della generazione del certificato server). attraverso il quale otterremo la chiave privata m2mqtt_srv.key del server crittografata mediante una “pass phrase”. Fatto ciò, passiamo alla generazione della richiesta di certificato da parte del server che dovrà essere firmato dalla CA. In questo modo generiamo la richiesta m2mqtt_srv.csr (attenzione ! non è ancora il certificato firmato) all’interno della quale ci sono tutte le informazioni del server (richieste dall’esecuzione del comando) tra le quali il CN va impostato uguale al nome del server stesso che fornirà il certificato all’atto delle richieste da parte dei client. Nel mio caso, poiché il broker sarà eseguito sul mio PC, il Common Name è uguale al nome del mio PC “ppatierno-PC”. L’ultimo passo consiste nel firmare la richiesta del server attraverso la CA ed ottenere il certificato definitivo del broker. Abbiamo così completato tutti i passaggi necessari alla generazione dei certificati. Abbiamo finalmente tutto ciò che ci serve per poter configurare il broker ! Attraverso il parametro –c specifichiamo il file di configurazione da usare mentre –v attiva la modalità “verbose” per visualizzare i messaggi di debug. Verrà richiesta la “pass phrase” della chiave privata del server necessaria durante l’handshake SSL/TLS nell’ambito dell’utilizzo dell’algoritmo di cifratura asimmetrica RSA. Nel mio caso, è stato fatto il binding all’indirizzo IPv6 del mio PC in corrispondenza del quale il broker si mette in ascolto sulla porta 8883. Abbiamo così il broker in esecuzione pronto per ricevere messaggi e distribuire i messaggi tra i vari client MQTT. Abbiamo specificato l’host e la porta al quale connettersi, il path del file certificato della CA per verificare il certificato server ricevuto durante l’handshake SSL/TLS, la versione TLS, il topic al quale sottoscriversi con il corrispondente livello di QoS ed infine la flag che attiva il debug per visualizzare i messaggi scambiati con il broker. Lo scambio dei messaggi per la connessione (CONNECT, CONNACK) ed il ping per mantenere viva la connessione tra client e broker (PINREQ, PINGRESP) è visibile anche nella console in cui stiamo eseguendo il broker stesso. Le classi del .Net Framework che permettono di gestire le connessioni SSL/TLS, come la classe SslStream, fanno uso della SSPI (Security Support Provider Interface) di Windows per la gestione dei certificati. Ciò vuol dire che, prima di utilizzare il certificato della CA all’interno della nostra applicazione client, è necessario installarlo nel nostro sistema operativo. Uno dei modi più semplici per accedere al wizard di import dei certificati è attraverso le “Opzioni Internet” per importare il certificato tra le “Autorità di certificazione radice attendibili”. Ricordiamoci che è necessario importare il certificato nel formato DER. Nel caso in cui il client sia sviluppato con il .Net Micro Framework, se fosse eseguito nell’emulatore, tale operazione sarebbe ancora necessaria, in quanto l’emulatore utilizza la medesima interfaccia verso il sistema operativo. Ovviamente, solo nel caso in cui l’applicazione sia eseguita su una board reale, il certificato della CA andrebbe semplicemente copiato su un supporto (es. Flash, scheda SD, …) per poi essere letto a runtime dall’applicazione stessa. Nel nostro caso, eseguiremo l’applicazione su un PC con il .Net Framework (il risultato sarebbe lo stesso eseguendo la medesima applicazione con il .Net Micro Framework sull’emulatore). Realizziamo il client e … pubblichiamo i messaggi criptati ! L’applicazione client, che utilizza la M2Mqtt library, non fa altro che connettersi al broker e pubblicare un dato finto di temperatura sul topic “sensor/temp” (al quale abbiamo sottoscritto un altro client al paragrafo precedente). 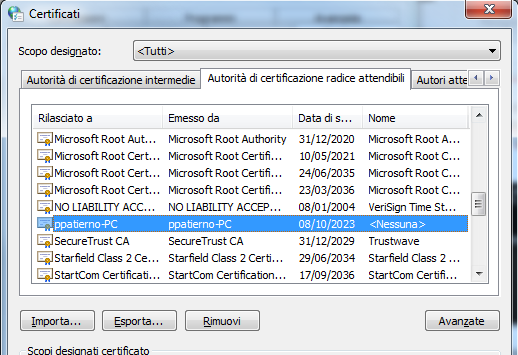 Il certificato della CA è stato incluso in un file di risorse (Resources.resx) ed, una volta letto come stream di byte, viene fornito al costruttore della classe X509Certificate, in modo da ricavare un certificato X.509 valido per l’MqttClient. Nelle finestre console del broker si evince la pubblicazione e lo scambio dei messaggi MQTT relativo al QoS 1 (Exactly Once). Nella finestra console del subscriber è possibile osservare il messaggio ricevuto dal publisher. Il protocollo MQTT non fornisce in maniera intrinseca funzionalità di sicurezza, per cui è necessario affidarsi a ciò che offre lo strato di trasporto su cui viaggiano i messaggi MQTT, ossia il TCP/IP. In questo caso, uno dei protocolli maggiormente utilizzati è SSL/TLS che mette a disposizione anche l’autenticazione del server oltre alla criptazione dei dati. E’ ovvio che tale strato, riduce le performance dell’intero sistema e la velocità con la quale i messaggi sono scambiati. Un’ulteriore possibilità potrebbe essere quella di applicare la criptazione direttamente sui dati contenuti nel messaggio MQTT ma ciò prevede l’utilizzo di un algoritmo di criptazione simmetrico stabilito a priori e per il quale i client hanno tutti conoscenza della chiave. Questa modalità, però, eliminerebbe l’autenticazione del server che andrebbe realizzata a livello applicativo in altro modo. In molti casi, comunque, l’adozione di una tecnica rispetto ad un’altra, dipende molto dalle potenzialità del nostro sistema che nel caso di sistemi embedded potrebbe non supportare l’SSL/TLS per una questione di costo di elaborazione ed occupazione di memoria delle librerie di criptazione.